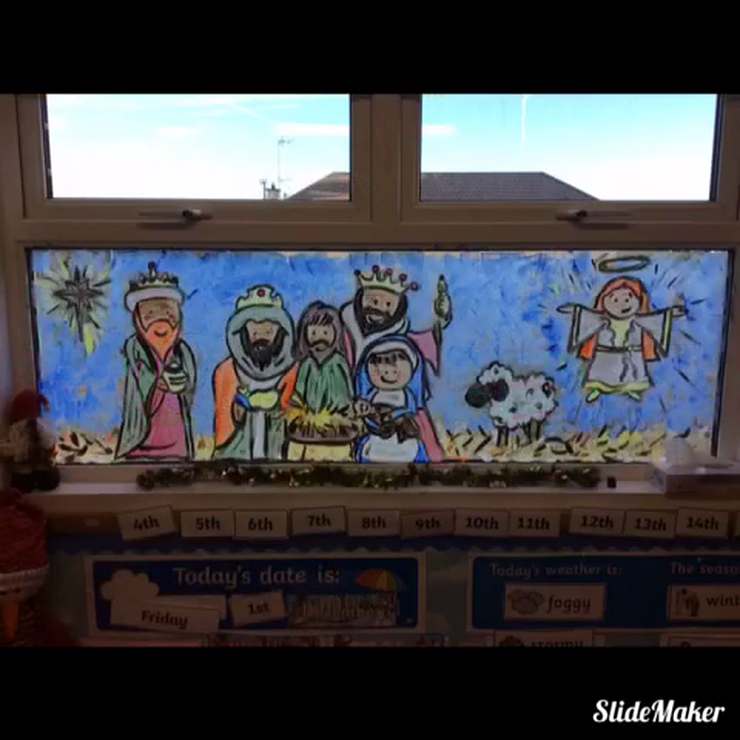 Check out this page every week to see photos and videos of our learning in action! As part of our Grow In Love Theme, 'The Church', Primary 1 went for a visit to our local Church. We looked at the altar, the crucifix, stained glass windows, the Church bell, candles and lots more. Conall has had great fun completing the farm jigsaw. 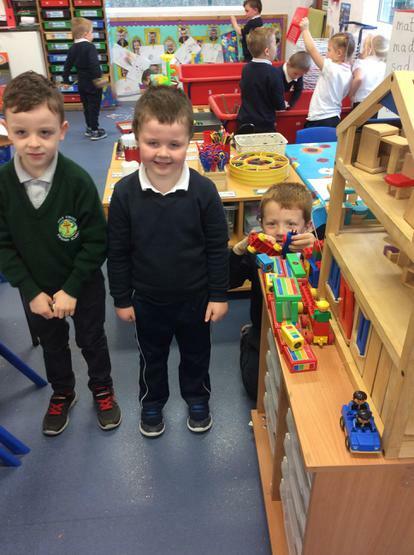 Primary One have been busy working on Capital Letters this week. 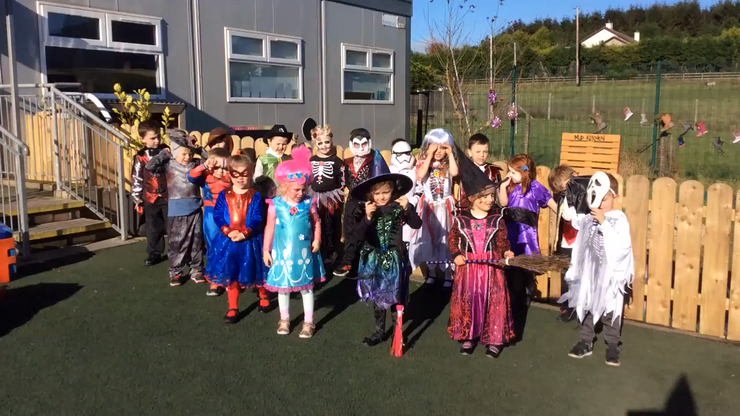 Primary One enjoying Green Day. 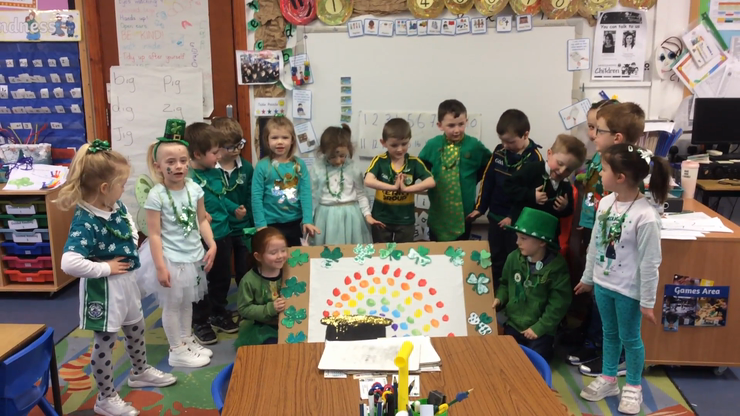 We had lots of fun learning our Poem 'I'm a little leprechaun'. Happy St Patrick's Day. We have been busying practising. 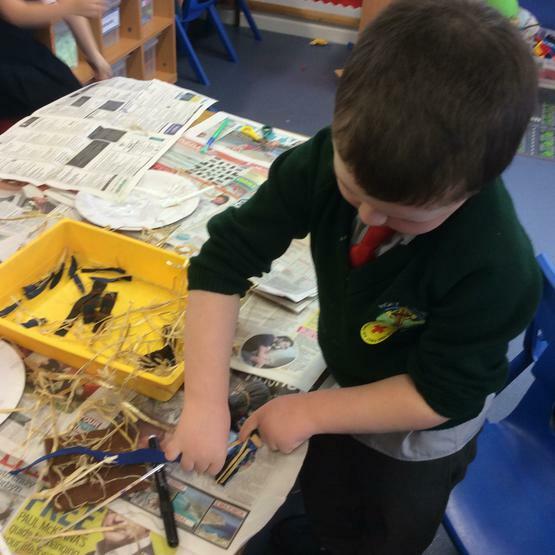 Primary One were busy this week exploring our topic of Spring in Learning Through Play. As part of World Book day in Primary One, we were busy reading and discussing Paddington Bear. We created these lovely pictures of Paddington for our display. 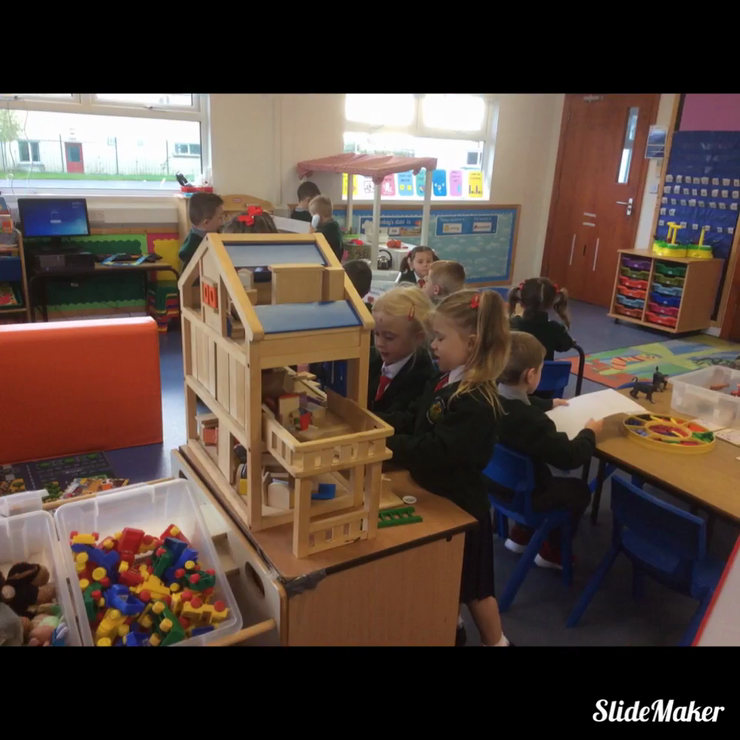 Emily created our sound this week -nk using the Sticklebrick as part of her learning through play. Well Done Emily. 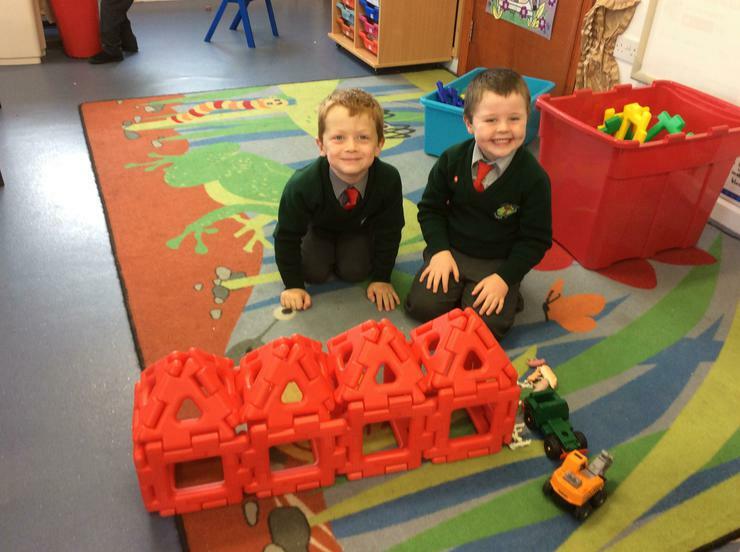 We have been working very hard on learning all about 3D shapes. We created animal shapes using the net of the shape. 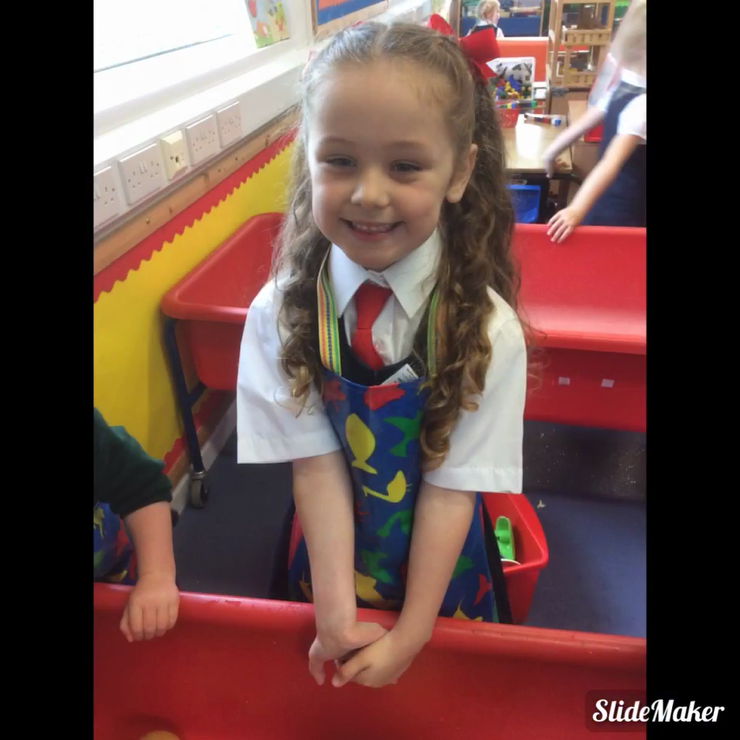 Primary One had loads of fun creating these. We were then able to discuss all the features and sort them into one criterion. Special Visit - Primary One had a special visit from Lottie and Jack's granda with a lovely lamb 🐏 Thank you Malachy. Water Tray Fun 😃 Raymond was busy making us "tea". Within our topic "People Who Help us" we created our own X-rays just like the ones the doctors take in hospitals. The children have enjoyed taking on the role of the doctor and nurse in our Holy Cross Hospital. 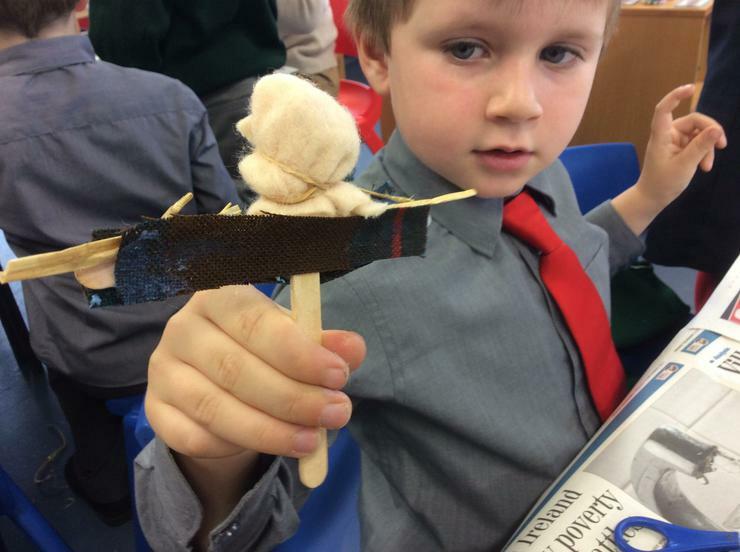 Learning Through Play- Raymond used the globe to plan which route Santa would take to deliver the presents. He decided that Santa would fly to India First. 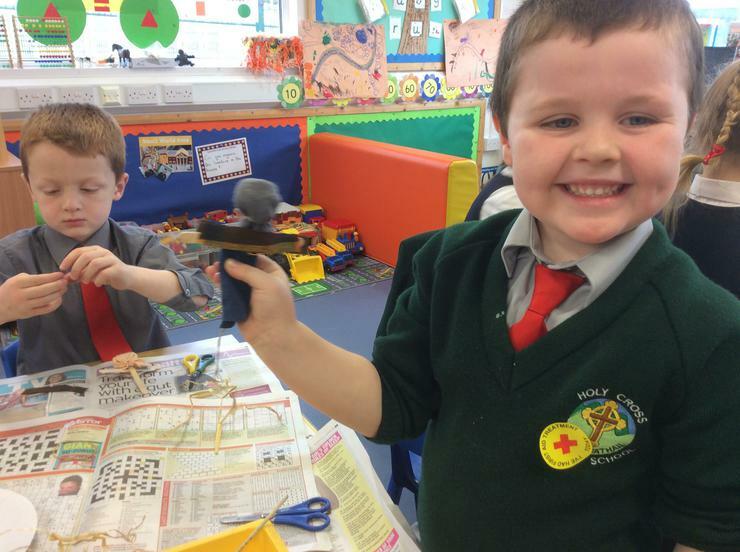 This week in numeracy we were measuring with non standard units. We used cubes to measure Santa's footprint and Christmas toys to help Santa work out how much wrapping paper he needs. 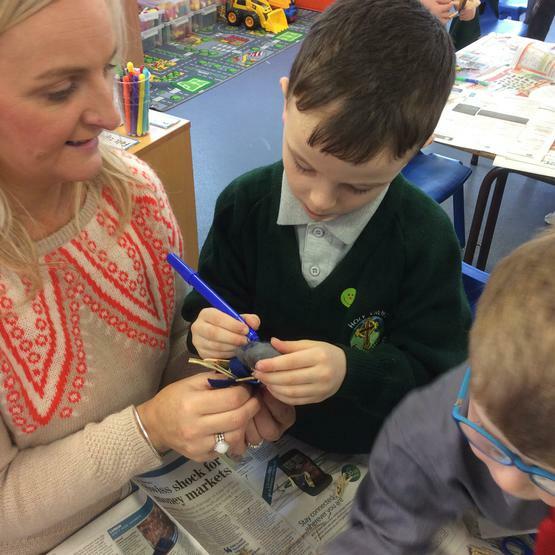 Mrs Norris visited our classroom as numeracy coordinator to see our learning in action. This term our school is focusing on procedural writing. 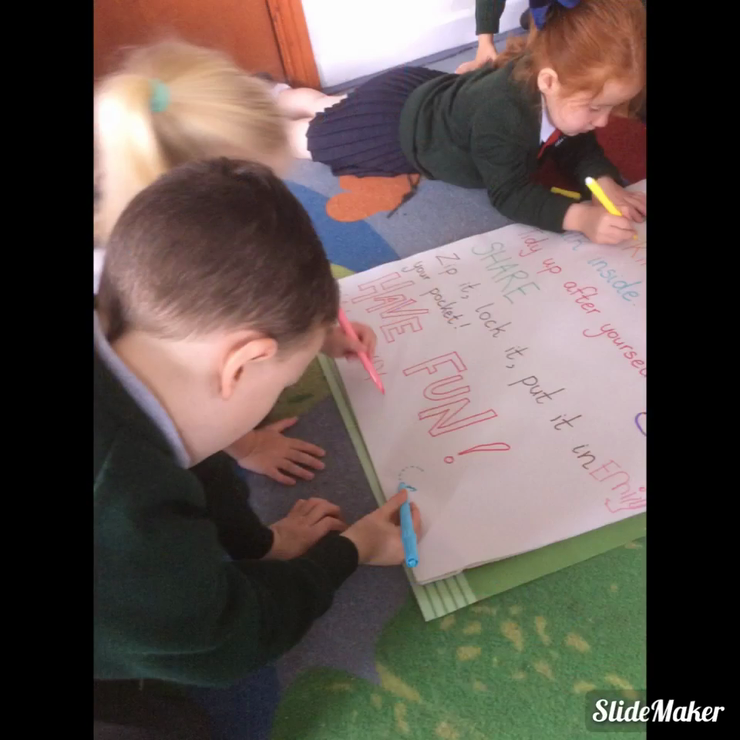 Primary One were very busy this week learning about and writing instructions. 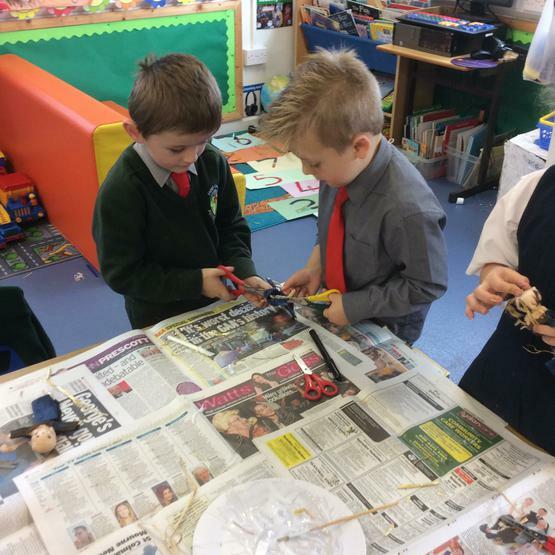 After focusing on the text, 'the little old lady who wasn't afraid of anything,' we decided to make some scarecrows and write instructions for others. 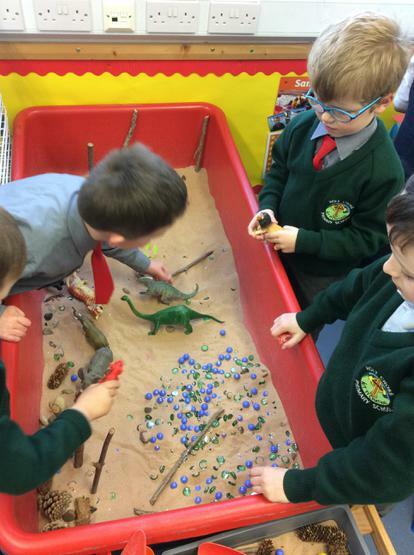 We had great fun with this week's maths challenge in the sand. One of our class targets is to make sets to 10 very carefully. It's important not to rush our counting. 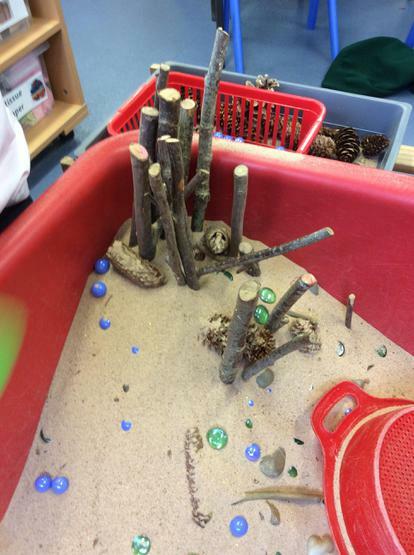 We worked very well at putting the correct amount of stones in each hole. 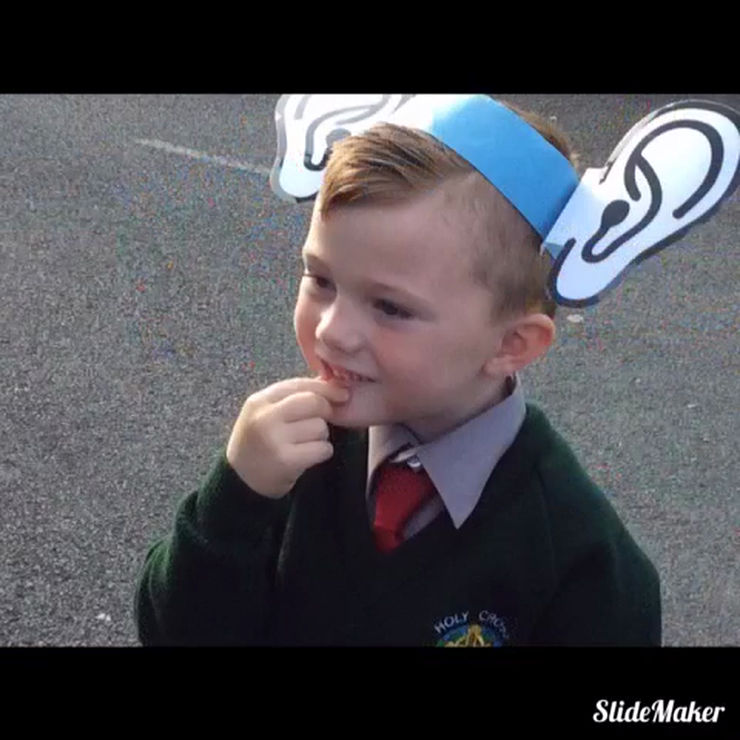 This week we were learning about our 5 senses. We brought in something from home to share with our friends. We had to close our eyes and guess what some of the objects were by using our other senses. How many ways can you make 5? As part of our patterns focus in mathematics and numeracy we created these elephants for the annual elephant parade (from the Story of Elmer). Thanks to Sharon and Denise for all the empty milk cartons! A big THANK YOU to Fiona White and TESCO for the tasty apples! We have been munching on them all week! We had to sort Elmer's colourful patches as one of our maths tasks. We were able to sort the colours into groups, create a simple graph and discuss the most common/least common colours. 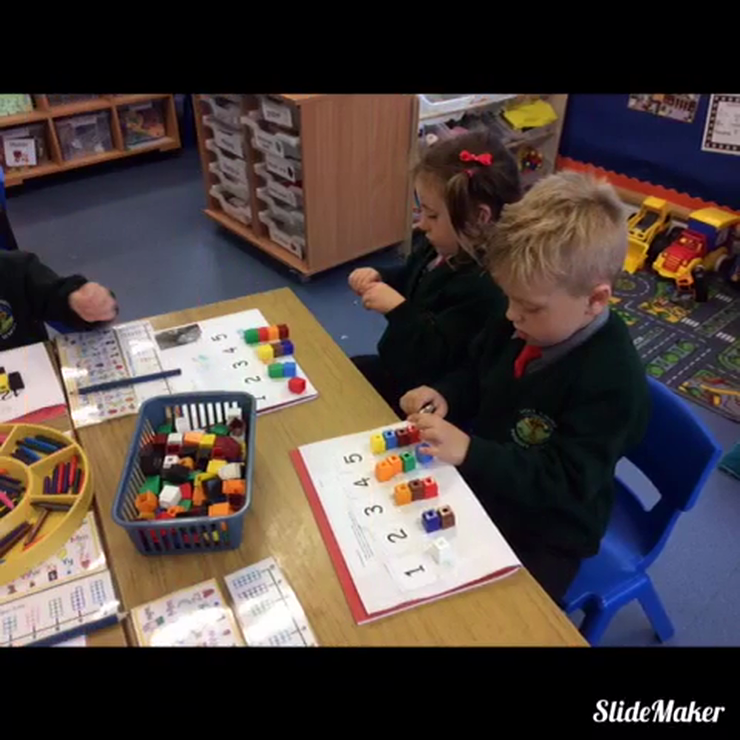 We practised making sets within 10 using pegs and jewels on numbered hands. 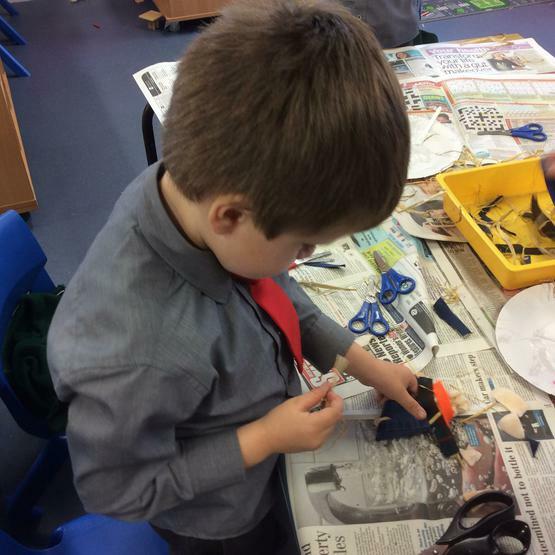 It was tricky pinching the jewels with the pegs but this helps develop our fine motor skills. Literacy: We focused on the story of Elmer this week. 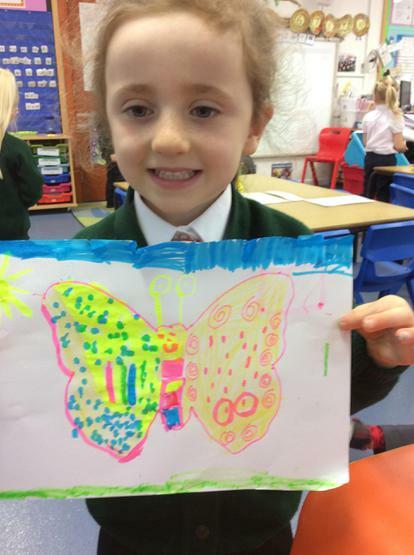 We enjoyed recreating the story on a story map and visualised the elephant characters in our literacy/art session. We have also started to blend some simple CVC words and have played magnetic phonics games. As part of our 'magical me' topic, we studied our facial features using mirrors and recreated them using paper plates and a range of media. We had a great day trying out a range of European foods, poetry and songs. 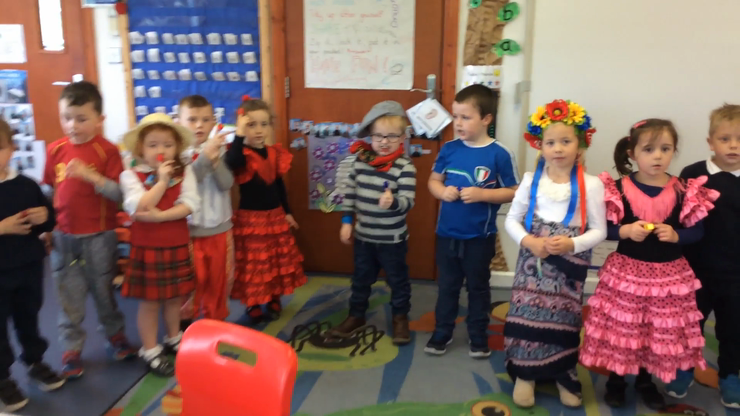 Here we are learning our colours song in Spanish. Week beg. 25.9.17. 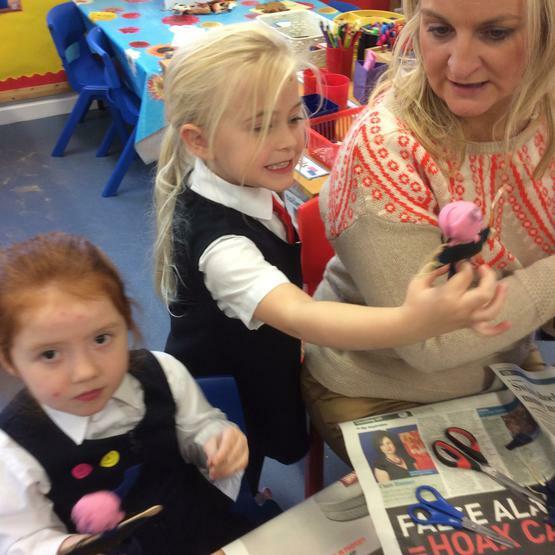 We read the three little pigs story this week and recreated the scene and characters in our art lessons. 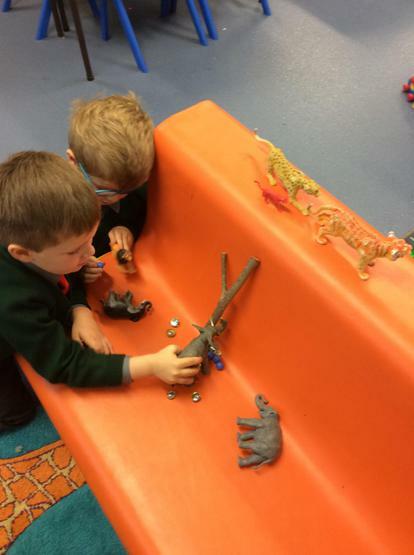 We will use these in our small world area to develop our speaking, listening and story telling skills. 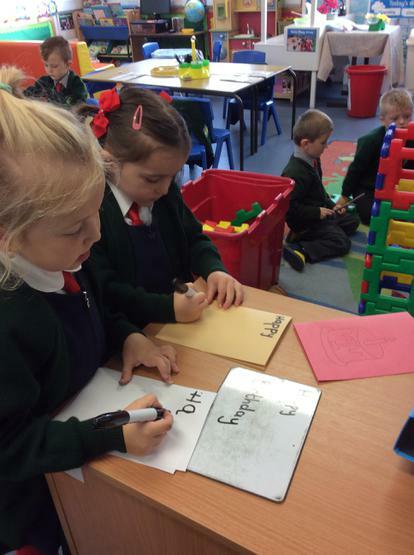 We worked very hard this week during our maths tasks. We built towers of different heights and played a dice game where we rolled a number and counted out glass beads in correspondence. 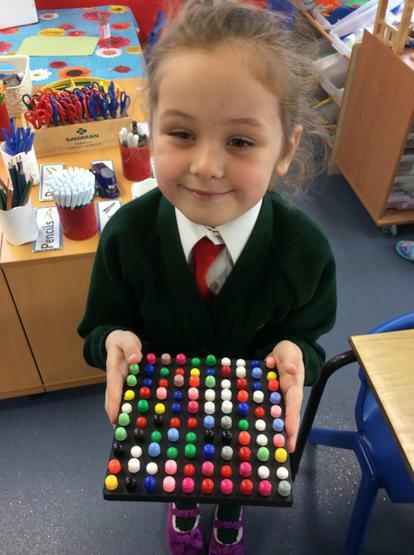 We counted up all of our glass beads and the winner of each group won a peg! We practised the formation of our new sounds and numbers in the sensory tuft tray. 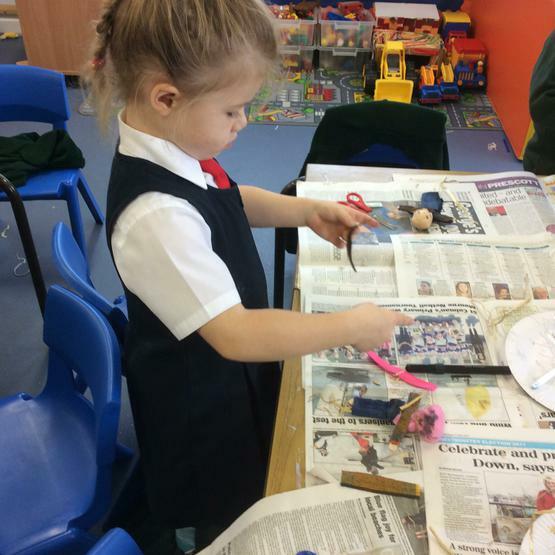 This week we added flour, sugar and glitter in the tray and used paintbrushes to make marks. We made a collage of our names using small squares of paper. This helps develop our fine motor skills. We were practising our number recognition and sets to 5 this week. 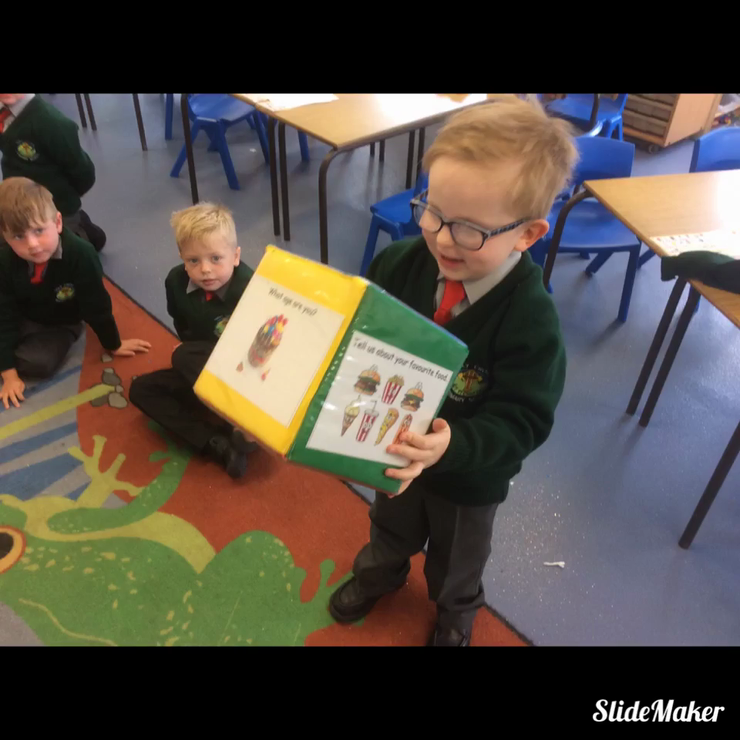 As part of our literacy (speaking and listening) lesson, we discussed the difference between inside and outside sounds. We used our big "listening ears" to listen carefully to our surroundings. We heard Bernie's keys rattling, birds singing in the trees, tractors and bin men on the road, the office phone ringing and even Denise walking in her high heels!! We used the class dice to play a "getting to know you" game. We had fun throwing and catching the dice, and answering questions about ourselves.